Our resident superhero has returned to shift work, and that means we are adjusting to a new balance in our house. It's been almost eight years of different kinds of dayshift/nightshift schedules, but it's still tricky to get used to again. We know he needs a good seven or eight hours to sleep, so he can be alert when he goes back out the next night. Giving him a quiet house is tough, because it's full of three crazy young kids (four on weekends), a dog, a cat, a ringing phone and the occasional doorbell. Our schedules again become less about days of the week and more about days on/days off, night shifts, swing shifts and early shifts. On the plus side, he's home with us more between work blocks, and I am free to schedule appointments during weekdays again without relying on a babysitter, yay! On the down side, he sometimes doesn't see Abby for days, missing her in the morning when he sleeps and returning to work before she comes home from school. That's been hard for her. I've found her in the morning watching out the window for his truck to return to our driveway, and she's upset when I tell her he's already home, but asleep, so shhhh. We have Summer's white noise machine moved to ours to muffle the sounds of our mornings and days. I try to plan activities out of the house to grant him some peace and quiet while he sleeps off a night shifts. I try to remember to give him space after a long day shift leaves his body and mind feeling like mush. Then those four or five days off in a row, there are two parents in this house and it feels amazing, like a little vacation. It sometimes feels like our whole family life revolves around his work, and sometimes that's a pain. Christmases have been missed, holidays, birthdays or get-togethers by myself. Asking family for help when I'm on my own for five days, planning days based on his sleep needs, and arranging my writing projects around his days off. But then I remember to put my ego aside, and keep in mind that he is working really hard, in 12-hour shifts (or longer), in sometimes dangerous circumstances, with short breaks, with paperwork to catch up on, and cold meals eaten from Tupperware containers in a car. Those nights he's working, and I go to sleep alone, it is such a comfort to be woken by his footsteps climbing the stairs. It means he is home, and safe. 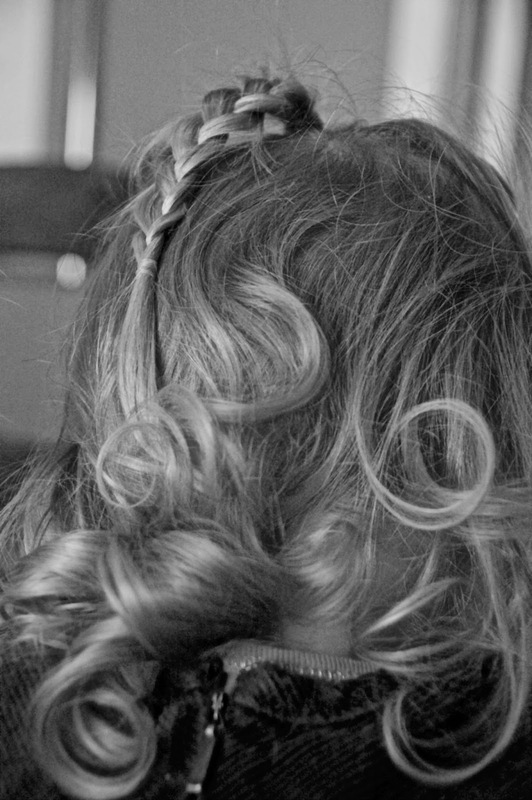 I took some time to stop and notice the beauty of three-year-old girl ringlets topped by a braid. I don't miss Matt doing shift work, or travel. But the on call can be miserable. But, him having that job allows us to stay in a place we love and it keeps me home and not having to work. So, like you, I am thankful! Those ringlets. My good god. The life! It's ever changing, always demanding (on everyone in the family), but brings us adventure and experienced we otherwise would never know! Sarah, this brought back so many memories of my mom telling me to "quiet down" and "stop jumping around" - eventually being told to go play outside - so my father could sleep during my waking hours. Though not RCMP, my dad worked shift work and now looking at it from an adult's perspective it must be so hard for family life. As a kid though, it came to be just the way things were and though there'd be days in a row I wouldn't see my dad, I also remember being lucky enough to be the kid whose dad was there for school field trips sometimes when the schedule lined up, phone calls on all those days I wouldn't see him (even in those grumbly-teenage years when I had nothing to say) and even a day of missing class once as a teenager so we could go skiing (it was the last day of school anyway). It is no doubt tough and I hope the adjustment goes OK. Most of my memories of my dad's shift work are pretty good, even if I did have to "quiet down" or go outside... so thanks for bringing back some good memories.